Coffee Shop! Donkey Kong Country: Tropical Freeze Wii U sale! Today, I wanted to let fellow Wii U owners know that Donkey Kong Country: Tropical Freeze (DKCTF) is on sale! Barely a month after it released, the game is already discounted 20% off its MSRP at two retailers. You can pick up a copy of Donkey Kong Country: Tropical Freeze for the Wii U from Best Buy (HERE) and Amazon.com (HERE) this week for just $39.99. Both sites include "Free Shipping" with the sale price, but with Best Buy you also have the option of checking your local store(s) to see if you can pick it up today if you want. Donkey Kong Country: Tropical Freeze is on sale at Best Buy for $39.99. Donkey Kong Country: Tropical Freeze is on sale on Amazon.com for $39.99. I did a plethora of Nintendo Channel data stories on Donkey Kong Country Returns (see: here, here, here, here, here, & here), and even one on the Wii's Virtual Console Donkey Kong Country SNES titles over the years. If you own a Wii, but not a Wii U, I would highly recommend picking up Donkey Kong Country Returns and giving it a try, especially if you enjoyed any of the older SNES titles in the series. If you have played Donkey Kong Country: Tropical Freeze (I haven't), would you recommend it to Wii U owners that might not be familiar with the "Donkey Kong Country" line of games? Also, if you have played and beaten DKCTF, how many hours did it take you? Are games art? Roger Ebert, the late film critic, made big waves in the video game community when he said that games weren't art and never would be. He then expounded on that quote later with an article and said, "Let me just say that no video gamer now living will survive long enough to experience the medium as an art form." He wrote that in 2010, and like I have disagreed with many critics before him, I disagree with his opinion on this topic as well. That's why when my good friends from DigitallyDownloaded launched a new Kickstarter campaign pertaining to this very topic, it became my first Kickstarter campaign to ever back! Their Kickstarter campaign is titled, Interactive Canvas; Gaming Artists, and you can find it HERE (the last three links should get you to the page!). And, if you missed the references, the Interactive Canvas is referred to not once, not twice, not three times, but FOUR times as a "coffee table-style" book, or publication. With the amount of content they are planning for the Interactive Canvas, it seems like a perfect book to flip through while you are enjoying your morning cups of coffee! Again, you can watch the video above to hear the idea behind it, and visit its Kickstarter page directly to get involved and back the project. Also, if you have any questions about the project, you can contact Matt from DigitallyDownloaded directly, by emailing him at: matts(@)digitallydownloaded.net. So, I performed another vanishing act, like a great magician, during the months of November and December (and much of January!) on the site. While I wasn't posting, I was keeping busy in the video game world and drinking lots of coffee though! What coffees did I consume and games have I been playing? Brew yourself some coffee, and let's take a look! The quick list: Beaumont Coffee Classic Roast, Community Coffee Medium Roast, Café Du Monde, Beaumont Coffee Gingerbread, Beaumont Coffee Salted Caramel, Beaumont Coffee Pumpkin Spice, and Beaumont Coffee Toasted Coconut. If you're wondering what's up with all the different Beaumont Coffee roasts and flavors, it is Mrs. Coffee's fault! I personally don't like flavored coffees (on a rare occasion maybe, like spotting a Sasquatch! ), but Mrs. Coffee does. So, when the holiday flavors hit the store shelves, she decided to try some out, as you can tell from the list! I don't mind the Beaumont Coffee Salted Caramel that much, and I'm not remember bad thoughts about the Toasted Coconut, but the Pumpkin Spice and Gingerbread just aren't for me. Will I still drink them? Yes. But, I would never buy them for myself. The flavors in them are a bit too artificial for me, and seem to cover up any actual coffee flavor. Still, I don't mind trying new flavors out, and was even glad to see Mrs. Coffee bring in some new coffee flavors during the holidays. Wii U - Call of Duty: Black Ops II, Tekken Tag Tournament 2, Wii Sports Club, Monster Hunter 3 Ultimate, LEGO City Undercover, Toki Tori 2+, F-Zero, Mega Man X, Super Mario Bros. 2, Donkey Kong, Wii Fit U, Nintendo Land, Kung Fu Rabbit, and Super Mario 3D World. 2DS - Luigi's Mansion: Dark Moon and Mario & Luigi Dream Team. Super Mario 3D World has been absolutely awesome to play through with Mrs. Coffee. While we started playing it in December, we have played it A LOT more this month. 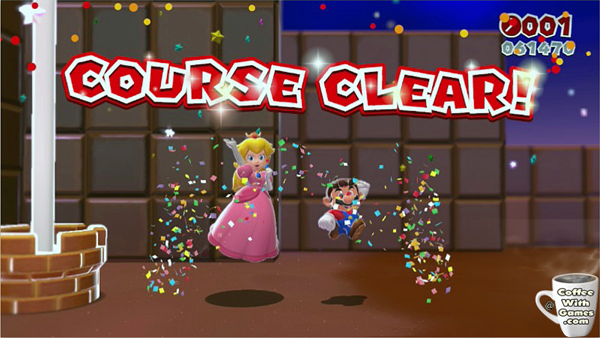 If you have ever enjoyed any Mario platforming games in the past, I highly recommend you giving Super Mario 3D World a try. We haven't finished everything in it just yet, but we are making excellent progress on our Mushroom Kingdom adventure. We have finished up the "main" portion of the game (saw the credits roll), and are working on finding and unlocking everything now. and saving/posting it to Miiverse. Notice the time in the top right corner? Ignore the timer at your own risk! Bean 1 received a Nintendo 2DS for Christmas, and he received both Luigi's Mansion: Dark Moon and Mario & Luigi Dream Team for it. I have helped him play both games, but Mario & Luigi Dream Team has gotten more play-time so far. And, I really like the game! While I have only played a Final Fantasy game for maybe 20 minutes, I have watched Mrs. Coffee play some in the past. The way the battles are in Mario & Luigi Dream Team reminded me of the battle system in some of the Final Fantasy games I have seen (probably a lot more simple though?). While I have been absent from posting, like I mentioned above, I have been busy working on a side project that has turned out to be a bit more time consuming than I ever imagined it would have been, when I first started it. Hopefully once I get the next step of my side project done, I will resume normal posting (whatever that is around here!). Since this is the first post-Christmas post, there were gaming and coffee related items on Christmas morning other than Bean 1's 2DS and games. Super Mario 3D World was the "family gift" for Christmas, and we actually went the digital route with it and downloaded it. I also received some coffee blends for Christmas, which I have been enjoying and they should be getting listed in the January Brewed post next month. Another Wii U title I grabbed during the holidays that was opened on Christmas morning was Scribblenauts Unlimited, but it wasn't played until after the first of the year. Being that this is the first post since Christmas, did any of you get a new system or new games for Christmas that you have been enjoying? Or, perhaps you got something coffee related and have been enjoying coffee more? 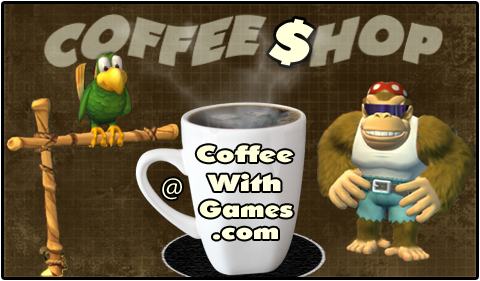 As always, if you have any questions about the games I played or the coffees I consumed that I posted about above, feel free to leave a question below or by contacting me directly!